Juba County was an administrative area in Central Equatoria state, South Sudan.)) It was the largest county in Central Equatoria and one of the largest in the entire region of Equatoria. Its county seat was Juba, the state capital of Central Equatoria and the national capital of the Republic of South Sudan. Its population according to the disputed 2008 census conducted by the Republic of the Sudan, prior to South Sudanese independence, was 372,413. In 2015, the county was turned into the state of Jubek. As of 2011, the county's payams, or sub-counties, included Bungu, Dollo (or Dolo), Ganji, Gondokoro, Lirya, Lo'bonok, Lokiliri, Mangalla (or Mangala), Northern Bari, Rejaf, Rokon, Tijor, and Wonduruba, the latter of which was administrated by Central Equatoria state. Former payams that became defunct before independence included Jokala, Juba, Kator, and Muniki. In March 2011, Juba, Kator, and Muniki payams were consolidated into Juba proper under the administration of the Juba City Council. The county also included part of Bandingilo National Park in its northeast. It borders Terekaka County to its north and Lainya and Kajo Keji counties to its south, as well as Mundri East and Mundri West counties in the state of Western Equatoria to its west, and Eastern Equatoria, namely Lapon, Magwi, and Torit counties, to its east. In August 2005, independence leader John Garang's funeral took place in Juba County. The month was also marked by ethnic violence in Juba and its environs. The villages of Katigiri and Wonduruba were inundated with refugees internally displaced by violence and looting in Juba County in February 2008. At least 750 people from Katigiri also relocated to Juba, the de facto metropolis of the county, during the looting. The United Nations, the county commissioner, and local militias responded to the situation. The county was the site of a month-and-a-half-long teachers' strike in November and December 2009 over furloughed salaries. The strike was resolved after the wages were paid. After the reorganisation of states decreed by President Salva Kiir Mayardit in 2015, Juba County became the Jubek State. In February 2016, the governor of the state decreed the creation of 7 new states from the territory of the former county. ^ "Police Shoot and Wound a Man in Land Dispute". Eye Radio. 16 May 2013. ^ "City limits: urbanisation and vulnerability in Sudan" (PDF). Retrieved 2017-03-15. ^ Isaac Vuni (8 July 2009). "South Sudan parliament throw outs census results". Sudan Tribune. ^ a b "Jubek Governor Creates 7 Counties, Appoints Commissioners". Gurtong. 17 February 2016. Retrieved 14 August 2016. ^ a b Stephen, Juma John (3 April 2011). "CES Governor Appoints Mayor For Juba City Council". Gurtong. Retrieved 28 July 2011. ^ "Juba County". Gurtong. Retrieved 28 July 2011. ^ Rice, Xan (6 August 2005). "Violence feared as thousands gather for Sudan funeral". The Times. Retrieved 28 July 2011. 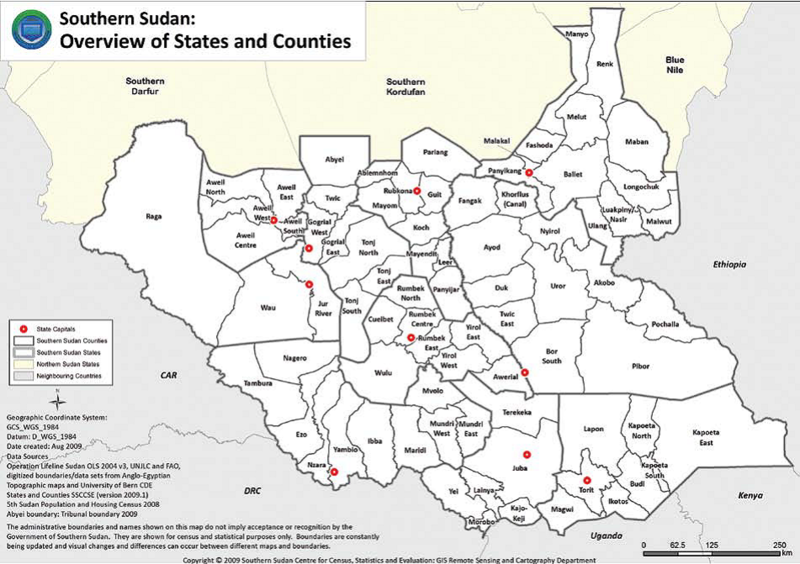 ^ "ACT Alert: 17/2008 - Juba County, South Sudan: Displacement due to conflict". ACT ReliefWeb. 22 February 2008. Retrieved 28 July 2011. ^ "Teachers End Strike in Juba County". Sudan Radio. 15 December 2009. Archived from the original on 9 October 2011. Retrieved 28 July 2011. This page was last edited on 12 January 2018, at 08:41 (UTC).